In the material world we possess riches and wealth in many ways, but sometimes not in very honest and pious ways, because that is the nature of accumulating wealth. According to Vedic injunction, therefore, such wealth should be purified by giving cows and gold in charity to the brāhmaṇas. A newborn child is also purified by giving grains in charity to the brāhmaṇas. In this material world it is to be understood that we are always living in a contaminated state. We therefore have to purify the duration of our lives, our possession of wealth and ourselves. The duration of life is purified by taking daily bath and cleansing the body inside and outside and accepting the ten kinds of purificatory processes. By austerities, by worship of the Lord, and by distribution of charity, we can purify the possession of wealth. We can purify ourselves by studying the Vedas, by striving for self-realization and by understanding the Supreme Absolute Truth. It is therefore stated in the Vedic literature that by birth everyone is born a śūdra, and by accepting the purificatory process one becomes twice-born. By studies of the Vedas one can become vipra, which is the preliminary qualification for becoming a brāhmaṇa. When one understands the Absolute Truth in perfection, he is called a brāhmaṇa. And when the brāhmaṇa reaches further perfection, he becomes a Vaiṣṇava or a devotee. In that ceremony, all the brāhmaṇas assembled began to chant different kinds of Vedic mantras to invoke all good fortune for the child. 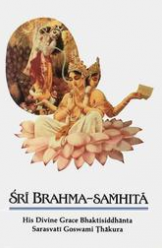 There are different kinds of chanting known as sūta, māgadha, vandī and virudāvalī. Along with this chanting of mantras and songs, bugles and kettledrums sounded outside the house. On this occasion, the joyous vibrations could be heard in all the pasturing grounds and all the houses. Within and outside of the houses there were varieties of artistic paintings, done with rice pulp, and scented water was sprinkled everywhere, even on the roads and streets. Ceilings and roofs were decorated with different kinds of flags, festoons and green leaves. The gates were made of green leaves and flowers. All the cows, bulls and calves were smeared with a mixture of oil and turmeric and painted with minerals like red oxide, yellow clay and manganese. They wore garlands of peacock feathers, and were covered with nice colored dresses and gold necklaces. As soon as they heard that mother Yaśodā had given birth to a child, all the cowherd women became overwhelmed with joy, and they also dressed themselves with various kinds of costly garments and ornaments and smeared scented cosmetics on their bodies. When the cowherd men saw the pastimes of the cowherd women, they became very joyful, and in response they also began to throw yogurt, milk, clarified butter and water upon the bodies of the gopīs. Then both parties began to throw butter on each other’s bodies. Nanda Mahārāja was also very happy to see the pastimes of the cowherd men and women, and he became very liberal in giving charity to the different singers who were assembled there. Some singers were reciting great verses from the Upaniṣads and Purāṇas, some were glorifying the family ancestors, and some were singing very sweet songs. There were also many learned brāhmaṇas present, and Nanda Mahārāja, being very satisfied on this occasion, began to give them different kinds of garments, ornaments, and cows in charity. It is very important to note in this connection how wealthy the inhabitants of Vṛndāvana were simply by raising cows. All the cowherd men belonged to the vaiśya community, and their business was to protect the cows and cultivate crops. By their dress and ornaments and by their behavior, it appears that although they were in a small village, they still were rich in material possessions. They possessed such an abundance of various kinds of milk products that they were throwing butter lavishly on each other’s bodies without restriction. Their wealth was in milk, yogurt, clarified butter and many other milk products, and by trading their agricultural products, they were rich in various kinds of jewelry, ornaments and costly dresses. Not only did they possess all these things, but they could give them away in charity, as did Nanda Mahārāja. Thus Nanda Mahārāja, the foster father of Lord Kṛṣṇa, began to satisfy the desires of all the men assembled there. He respectfully received them and gave them in charity whatever they desired. The learned brāhmaṇas, who had no other source of income, were completely dependent on the vaiśya and kṣatriya communities for their maintenance, and they received gifts on such festive occasions as birthdays, marriages, etc. While Nanda Mahārāja was worshiping Lord Viṣṇu on this occasion and was trying to satisfy all the people there, his only desire was that the newborn child Kṛṣṇa would be happy. Nanda Mahārāja had no knowledge that this child was the origin of Viṣṇu, but he was praying to Lord Viṣṇu to protect Him. Rohiṇīdevī, mother of Balarāma, was the most fortunate wife of Vasudeva. She was away from her husband, yet just to congratulate Mahārāja Nanda on the occasion of the birth ceremony of his son, Kṛṣṇa, she dressed herself very nicely. Wearing a garland, a necklace and other bodily ornaments, she appeared on the scene and moved hither and thither. According to the Vedic system, a woman whose husband is not at home does not dress herself very nicely. But although Rohiṇī’s husband was away, she still dressed herself on this occasion. From the opulence of the birth ceremony of Kṛṣṇa, it is very clear that at that time Vṛndāvana was rich in every respect. Because Lord Kṛṣṇa took birth in the house of King Nanda and mother Yaśodā, the goddess of fortune was obliged to manifest her opulences in Vṛndāvana. It appeared that Vṛndāvana had already become a site for the pastimes of the goddess of fortune. After the birth ceremony, Nanda Mahārāja decided to go to Mathurā to pay the annual tax to the government of Kaṁsa. Before leaving, he called for the able cowherd men of the village and asked them to take care of Vṛndāvana in his absence. When Nanda Mahārāja arrived in Mathurā, Vasudeva got the news and was very eager to congratulate his friend. He immediately went to the place where Nanda Mahārāja was staying. When Vasudeva saw Nanda, he felt that he had regained his life. Nanda, overwhelmed with joy, immediately stood up and embraced Vasudeva. Vasudeva was received very warmly and offered a nice place to sit. At that time Vasudeva was anxious about his two sons who had been put under the protection of Nanda without Nanda’s knowledge. With great anxiety, Vasudeva inquired about them. Both Balarāma and Kṛṣṇa were the sons of Vasudeva. Balarāma was transferred to the womb of Rohiṇī, Vasudeva’s own wife, but Rohiṇī was kept under the protection of Nanda Mahārāja. Kṛṣṇa was personally delivered to Yaśodā and exchanged with her daughter. Nanda Mahārāja knew that Balarāma was the son of Vasudeva, although he did not know that Kṛṣṇa was also Vasudeva’s son. But Vasudeva was aware of this fact and inquired very eagerly about Kṛṣṇa and Balarāma. Vasudeva then addressed him, “My dear brother, you were old enough and very anxious to beget a son, and yet you had none. Now by the grace of the Lord you are fortunate to have a very nice son. I think that this incident is very auspicious for you. Dear friend, I was imprisoned by Kaṁsa, and now I am released; therefore this is another birth for me. I had no hope of seeing you again, but by God’s grace I can see you.” Vasudeva then expressed his anxiety about Kṛṣṇa. Kṛṣṇa was sent incognito to the bed of mother Yaśodā, and after very pompously celebrating His birth ceremony, Nanda went to Mathurā. So Vasudeva was very pleased and said, “This is a new birth for me.” He never expected that Kṛṣṇa would live because all his other sons were killed by Kaṁsa. The purport of this expression by Vasudeva is this: although he had eight sons born in the womb of Devakī, unfortunately they were all gone. He could not even keep his one son Kṛṣṇa with him. Vasudeva was feeling His separation, but he could not express the real fact. “Please tell me about the welfare of Vṛndāvana,” he said. “You have many animals–are they happy? Are they getting sufficient grass and water? Please also let me know whether the place where you are now living is undisturbed and peaceful.” This inquiry was made by Vasudeva because he was very anxious about Kṛṣṇa’s safety. He knew that Kaṁsa and his followers were trying to kill Kṛṣṇa by sending various kinds of demons. They had already resolved that all children born within ten days of the birthday of Kṛṣṇa should be killed. Because Vasudeva was so anxious about Kṛṣṇa, he inquired about the safety of His residence. He also inquired about Balarāma and His mother Rohiṇī, who were entrusted to the care of Nanda Mahārāja. Vasudeva also reminded Nanda Mahārāja that Balarāma did not know His real father. “He knows you as His father. And now you have another child, Kṛṣṇa, and I think you are taking very nice care for both of Them.” It is also significant that Vasudeva inquired about the welfare of Nanda Mahārāja’s animals. The animals, and especially the cows, were protected exactly in the manner of one’s children. Vasudeva was a kṣatriya, and Nanda Mahārāja was a vaiśya. It is the duty of the kṣatriya to give protection to the citizens of mankind, and it is the duty of the vaiśyas to give protection to the cows. The cows are as important as the citizens. Just as the human citizens should be given all kinds of protection, so the cows also should be given full protection. Vasudeva continued to say that the maintenance of religious principles, economic development and the satisfactory execution of meeting the demands of the senses depend on cooperation among relatives, nations and all humanity. Therefore, it is everyone’s duty to see that his fellow citizens and the cows are not put into difficulty. One should see to the peace and comfort of his fellow man and the animals. The development of religious principles, economic development and sense gratification can then be achieved without difficulty. Vasudeva expressed his sorrow due to not being able to give protection to his own sons born of Devakī. He was thinking that religious principles, economic development and the satisfaction of his senses were therefore all lost. After the friendly conversation between Nanda Mahārāja and Vasudeva, Vasudeva returned to his home. The cowherd men headed by Nanda Mahārāja, who had come to Mathurā to pay their taxes, also returned.